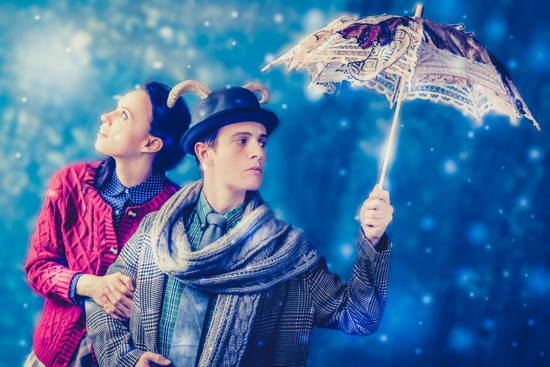 How could an adventurous story about four children, a faun, a beaver, a witch, a lion, an epic battle, and a magical land called Narnia be told with only two actors on a tiny stage? That was the question I asked myself when I attended Adventure Theatre MTC’s production of “The Lion, the Witch, and the Wardrobe” on December 3, 2016. And more importantly, how could it be told in a way that didn’t compromise the integrity of this classic children’s novel by C.S. Lewis? Actors Audrey Bertaux and Chris Dinolfo, under the direction of Tom Story, surprised and delighted me with their response to this challenge – and believe me, I was a tough audience member to please because I read and re-read and re-read again the Narnia series throughout my childhood. If you are a fellow aficionado who, like me, was sorely disappointed by the most recent film adaptation of the novel, fear not! You will be completely won over by this perfect adaptation. If you’ve read the book, you’ll love this retelling and if you haven’t read it, this performance will give you the best introduction to the world of Narnia that you could hope to receive. A giant wardrobe (for the children, that’s an old-fashioned, free-standing clothes closet) is a key element in the story and Scenic Designer Luciana Stecconi made it the focal point of the set. As there is no stage curtain, the white and gold-trimmed wardrobe commanded my attention as soon as I stepped into the theatre. Stecconi chose a bright blue patterned wallpaper for the backdrop of the set which made the white and gold wardrobe pop. The story is set in World War II England, and the other elements of the set added to the authentic period look. From antique light fixtures to suitcases, to a 40s-style coat draped on a hook, Properties Designer Andrea “Dre” Moore drew me in and reassured me that yes, this would be the world that C.S. Lewis described. The best part was that because I had been set up to cheerfully allow for the simplicity of the production, I was surprised again and again throughout the show by the actually exquisite sprinkling of costumes, sets, action, and diverse characters. I thought that I wouldn’t get to see the land of Narnia at all because of the simple staging – I was wrong and it was a beautiful surprise (which I won’t spoil for you.) I expected all of the action to be pantomimed without special effects. And while the miming itself was spectacularly done by Bertaux and Dinolfo to the point where I cringed both times that Lucy accidentally steps on the Beaver’s tail, I was as delighted as the many children in the audience by the unexpected and multiple special effects throughout the show. Bertaux and Dinolfo each perform about five fully realized characters and sometimes make split-second changes from persona to persona – even trading characters when needed to allow for the action. Bertaux’s playful exuberance as Lucy completely drew me in to be as enthusiastic as she was, and she made me laugh when she would abruptly switch to the somewhat stuck-up Susan. And, I particularly enjoyed Bertaux as the White Witch. Her haughty command of evil was spectacular. Dinolfo as Edmund was mopey, slimy, and hilarious, and he was able to switch to the slightly nervous but sweet Mr. Tumnus and the silly Beaver (with the stepped-upon tail) and make each of them just as captivating. The lighting by Sarah Tundermann and the sound effects by Kenny Neal added to the magic of the performance. Just as I wasn’t prepared for the special visual effects, I also wasn’t expecting so many lighting and sound effects and the unexpectedness of each one further sparked my imagination and drew me into the story. 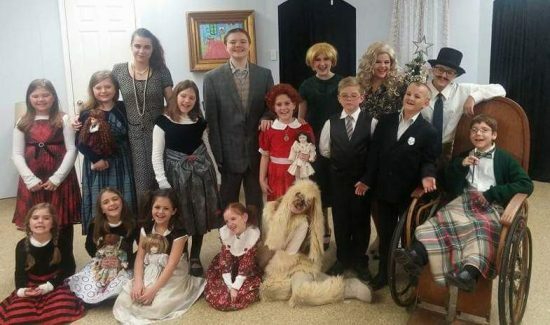 I was impressed with the costumes by Tyler Gunther because, with the addition or subtraction of one or two items, he drew me into the actors’ quick character changes. I loved the White Witch’s glamorous Cruella deVilian fur coat and the many umbrellas were a neat effect (again, no spoilers!) I also appreciated how the costumes accurately brought to life C.S. Lewis’s original illustrations for the novel. I highly recommend “The Lion, the Witch, and the Wardrobe” as a fabulous show for all ages to enjoy this holiday season. If you’ve read the book, you’ll love this retelling and if you haven’t read it, this performance will give you the best introduction to the world of Narnia that you could hope to receive. Running Time: 1 hour, with no intermission. “The Lion, the Witch, and the Wardrobe,” directed by Tom Story, runs through Dec. 31, 2016, at Adventure Theatre MTC in Glen Echo, MD. Click here for more information. Due to a database conversion, Adventure recommends calling 301-634-2270 to purchase tickets.